One of the biggest lessons you can learn when you start to really look at marketing your books is about creating anticipation. Think of the last big movie you were looking forward to. You might have heard about it when the film rights were first acquired, that’s common for best-selling books. The announcement of a movie based on the Harry Potter books, or a popular novel like The Fault in Our Stars makes big news. Later you’ll hear about who has been cast to play leading roles. There are occasional updates during shooting, particularly if there are cost overruns, accidents, delays, or celebrity spats on set. Eventually stars will start to show up on television talk shows, and of course everyone knows that means the opening of the new film is within the week. Time to get excited and book your tickets or make arrangements with friends to go to the show! No matter where you first encounter this long train of attention-building promotions, you will be drawn into the story around the movie from lots of different angles. And every one helps to build anticipation for the eventual release. An old piece of advice, mostly aimed at nonfiction authors, is to start preparing the ground for your books 3 years before you intend to publish. But the fact remains that time you put into preparing to publish is extremely valuable and can’t really be substituted by a big social media push, by hiring an expensive publicist, or anything else for that matter. This is personal, on the ground, market research, and it’s irreplaceable. Like the long run-up to a movie release, internet marketers of all kinds have learned the advantages of early promotion. This type of content, whether it’s email, videos, handouts, webinars, or any other type, serves the three purposes list above. But keep in mind this content is released before any kind of launch is officially underway. If you’re launching a product, whether it’s a new book or something else, it will likely never be mentioned in this preliminary content. Brian Clark of Copyblogger often talks about their editorial responsibility to educate the readers they attracted so they would become more educated consumers of what Copyblogger would eventually offer. By keeping in close contact with his audience, Brian was able to leverage this idea (and many others) into a vast online business enterprise. Likewise, you can help educate your own readers, too. 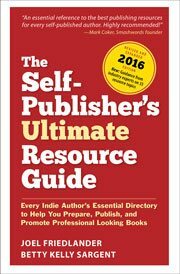 As an example, here on my blog I’ve spent years educating authors about what it takes to produce beautiful and effective, industry-standard book, particularly print books. All this education has creating a community of people who understand why books look and function the way they do, with a healthy respect for the norms and conventions of book publishing. I talked about fonts, book layouts, copyright concerns, and all the other things that go into physical books when you manufacture them. When, after several years, I started offering products like book templates, people were ready to buy, and all that preparation made a huge difference in how enthusiastically and how quickly authors took to these time- and money-saving products. Look at the long view. If you plan to be in this business for a while, or to make a career as an entrepreneurial author, nothing else makes sense. Educating and entertaining your audience is a high form of service to your community, one that will pay you massive dividends over the years. Don’t just rely on selling your books or services, or running hysterical book launches, then collapsing: pre-sell by educating your audience, build anticipation in your readers, and deliver the goods. Some of the most crucial psychological ideas used in internet marketing originated with Robert Cialdini’s classic book, Influence. If you’ve ever wondered about ideas like scarcity, reciprocity, or social proof, this is where they come from. Cialdini recently published Presuasion, which goes into a lot of depth on the idea of “pre-selling” in all its various forms. Photo: Pixabay. This post contains affiliate links. I have just spotted an opportunity to publish it with Amazon’s POD service which should result in 50,000 copies sold in two or three years with very little promotion. Nevertheless, I sent 2/3 of the PDF of the manuscript to a financial advisor in Toronto and he said he wants 200 copies from my first print run of the print offset edition (with a different ISBN) that I will do other than the Amazon POD edition. So the book is a success to me already. Ernie, this is fabulous! I hope you’re not limiting the promotion for bulk orders to the Toronto financial advisor. Also market to estate planning attorneys. Have you tried to get publicity for your book in your local weekly and daily newspapers and business journal or business magazine? Fantastic pre-selling, Ernie, especially even before you go to press, it sure takes the sting out of that printer’s invoice.